Are you planning to add a hot tub to your garden? Did you know that there are different types of hot tubs to choose from? Get to know the best hot tubs and how you can spot the best for you using the information below. A hot tub is one of the best investments that you can have, which you can use during your down time to get the relaxation that you need. It helps in encouraging you to take some time off and enjoy not only the tub but as well as the beauty of your garden. The good thing about the hot tubs is that they are not only here to help you relax, but they are here to help eliminate pains and aches that you have been experiencing after a long day at work. There are different types of hot tubs available in the market today, and people like you are having a hard time choosing the best one. Fortunately, the information below will help you in knowing the right things to look for when purchasing hot tubs. Find out what these things are by reading the information provided for you below. What Hot Tub is Right for you? The first thing that you need to do is to consider the budget that you have. The best thing that you can do is to check online about the non-essentials and essential things to look for in a hot tub. Of course, the basic ones are the cheapest ones, and they usually have hydrotherapy benefits. But if you are looking for something that has different sensors for entertainment and enjoyment then you definitely should have enough budget for it. The next thing that you need to do is to check how many seats you need in a hot tub. If you have space, then getting a tub that is large enough for you and your family will do. If you live alone and don’t often have parties in your garden, then a smaller version will do. Typically, smaller ones can let a couple of people sit on it and can even let you lie down. The best way to know the right size that you need is to check the lifestyle that you have. Hot tubs usually have jets, and they all of them have different specializations and purposes. If you are looking for a tub that can help in deep tissue massage, then the power and the placement of jets are necessary. You can ask a hot tub specialist in the store about the kind of experience that you want to experience for you to be able to choose the right types of jets that you want for your hot tub. Of course, you also need to consider the comfort of the hot tub. This means that you need to check your height for you to know if the hot tub that you are going to purchase is the right one for you. You can start sitting in the tub and check if you can comfortably stretch your legs and if you can move with ease. If yes, then you are eyeing the hot tub that is right for you. These are the things that you need to consider when purchasing a hot tub for your garden. But you may be wondering the benefits that you can get if you indeed purchase one. Let’s find out below. The temperature of the water in the tub will let the blood to provide the needed nutrients to your skin cells. It also can remove the wastes from your body, which will, in turn, provide you with a glowing and healthier skin. Another good thing about purchasing a hot tub is that it helps your body recover faster. In fact, soldiers are soaking in the tub with hot water to help them recover from emotional, mental, and physical stress. It’s better to unwind around your garden as it will provide additional relaxation. If you are one who suffers from a migraine or a headache due to stress, then using a hot tub is ideal. The reason behind this is because it lessens the tension that your body is experiencing. This also means that you no longer have to take medications more often. Soaking in a hot tub helps the circulatory system to freely flow, which will then help relax joints and stiff muscles. The hot water will also help the pressure to be alleviated, which will provide you with relief. Above are the amazing benefits that you can experience for having a hot tub in your garden. Now, it is time for you to know the top 5 best hot tubs to choose from below. 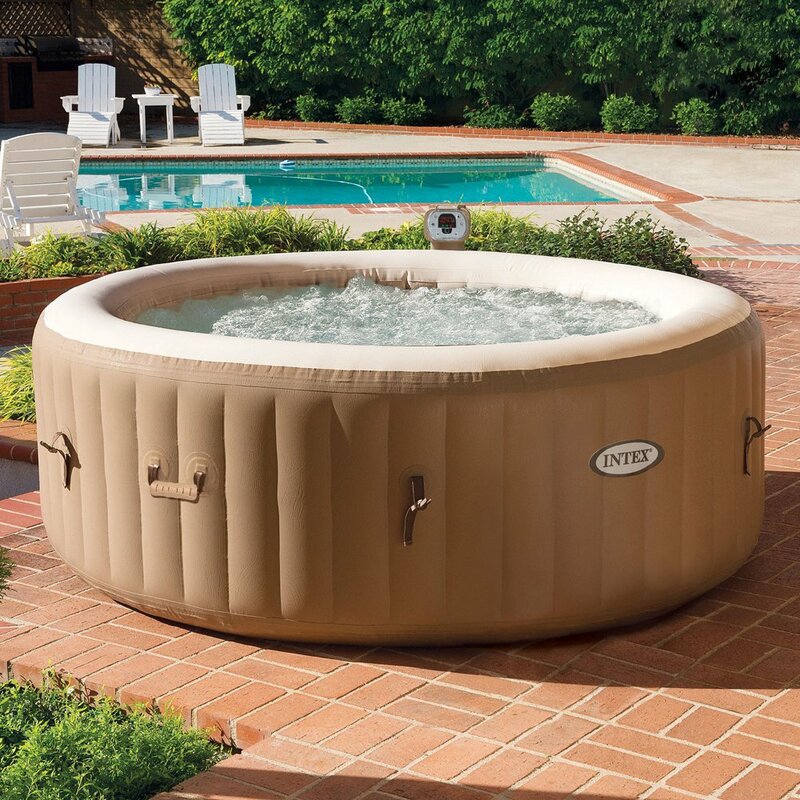 Coleman Lay Z Spa Inflatable Hot Tub is equipped with a digital control panel, wherein it will automatically start or stop the timer controlled heating system. All you have to do is to set the tub’s temperature that you want and start activating the Lay-Z Massage for you to comfortably and relaxingly experience a spa-like treatment. 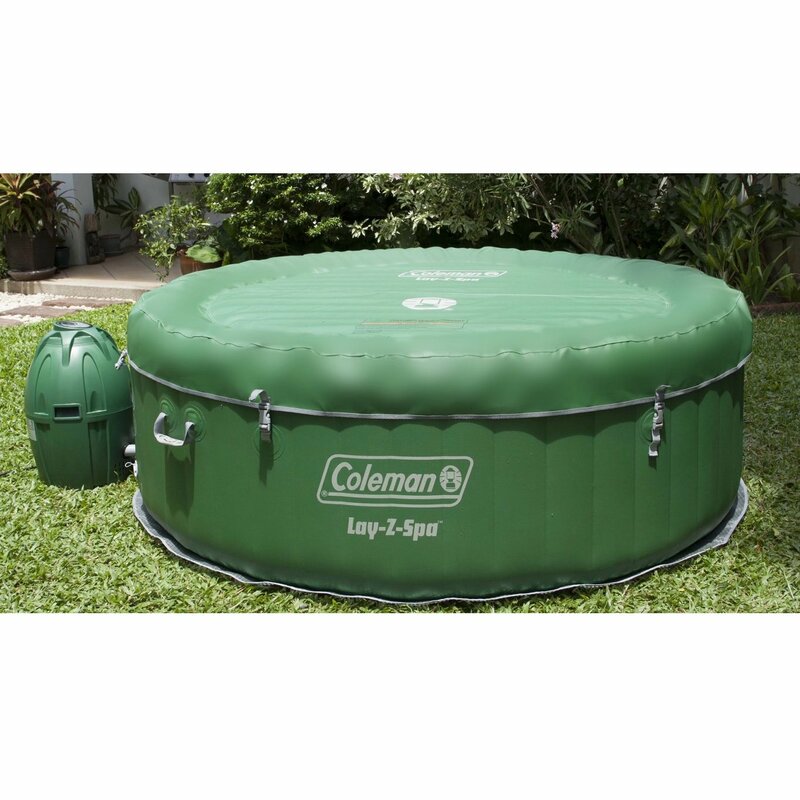 The Coleman hot tub has a superior strength and knows as durable since the exterior is puncture and leathered resistant. It is made out of TriTech 3 ply material, which features a polyester core mesh encased and two layers of PVC to ensure disability and strength. 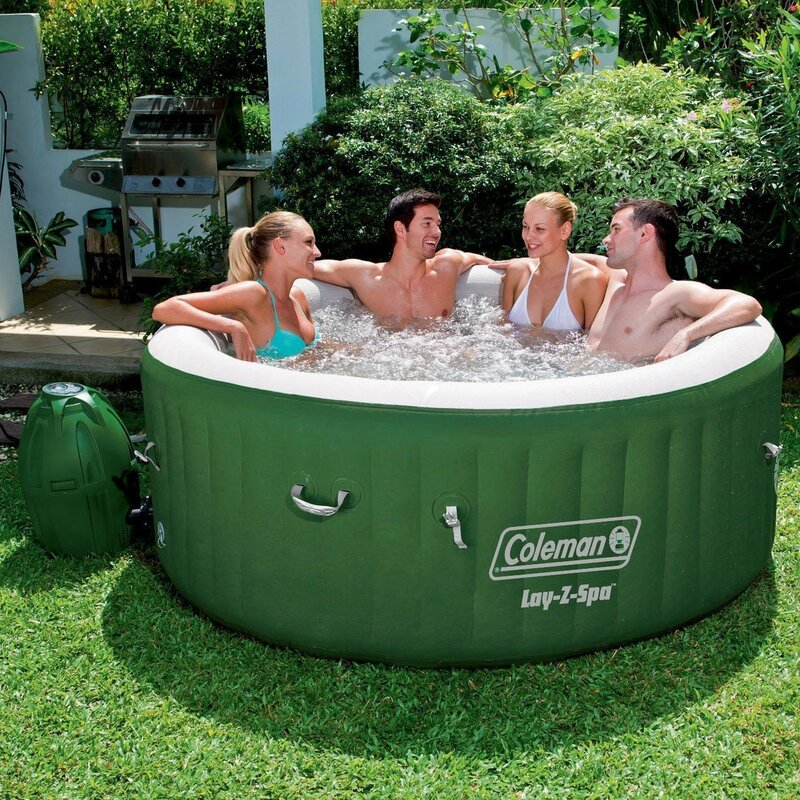 The Coleman Lay Z Spa Inflatable Hot Tub has a wall that is made out of I-Bean construction. This means that you will be able to sit on all of the sides without buckling or bending. It also features an air pad separate cushioned floor, which comfortably sits underneath the tub. Another good thing about this is that it also helps in minimizing and insulating the loss of heat. 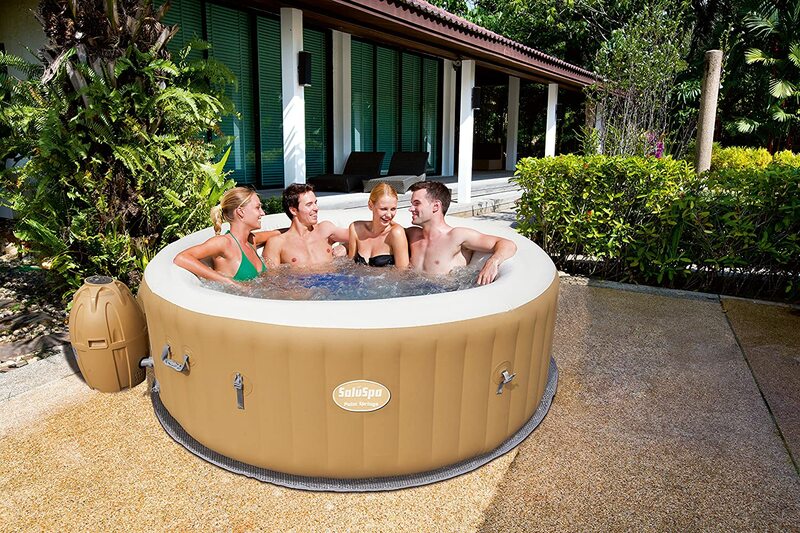 SaluSpa Palm Springs AirJet Inflatable 6-Person Hot Tub can comfortably accommodate a maximum of 6 persons. It is known to be durable and has a floor that is cushioned to ensure that you can soak in the tub very comfortably. Since it has a bubble jet massage, it will make sure that your body will get the massage that it needs after a long day at work. Once you get a hold of this hot tub, all you have to do is to set it up, plug it, and turn it on so you can enjoy it instantly. The SaluSpa Palm Springs AirJet Inflatable 6-Person Hot Tub can heat the water at 104 degrees Fahrenheit at a certain speed of 3 degrees Fahrenheit per hour. It has a cover that is insulated, which will help in speeding up the process of heating the water. It can also contribute to maintaining the temperature of the hot tub as well. The tub will also let you use bromine or chlorine to ensure that the water will stay clean and fresh. Lastly, it has a time controlled system for you to shut it off at the right time. 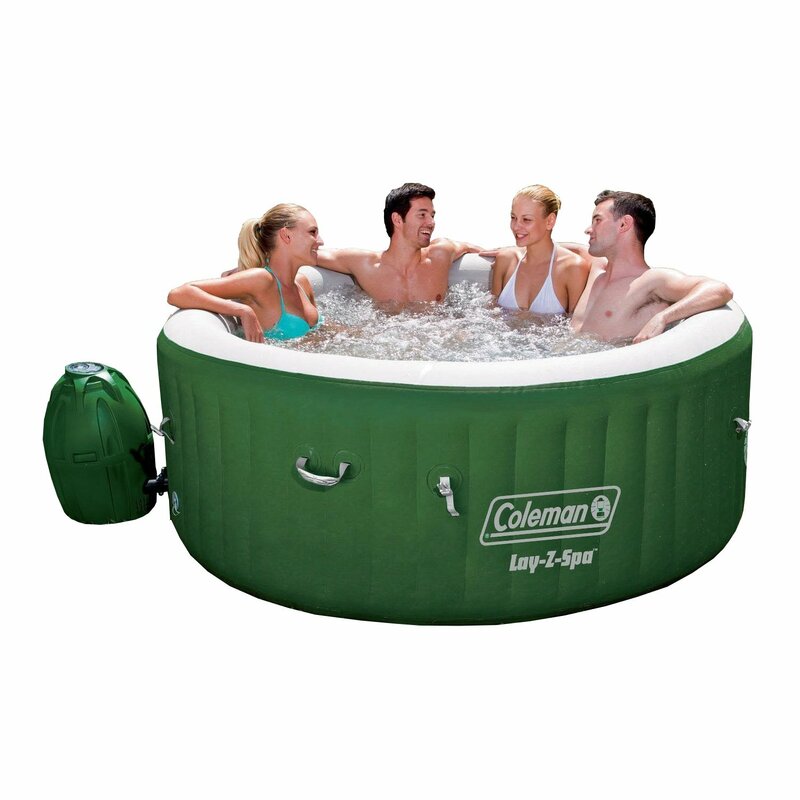 Coleman Saluspa 4-Person Portable Inflatable Outdoor Spa Hot Tub’s exterior is made out of fabric that is specifically coated to ensure that it will withstand the elements outdoor. It is colored in green, which is Coleman’s signature color of hot tubs. The floor is equipped with a cushion to ensure that your feet will feel comfortable. It also has several jet lines for the bubbles to help your body be massaged after a long day outside. 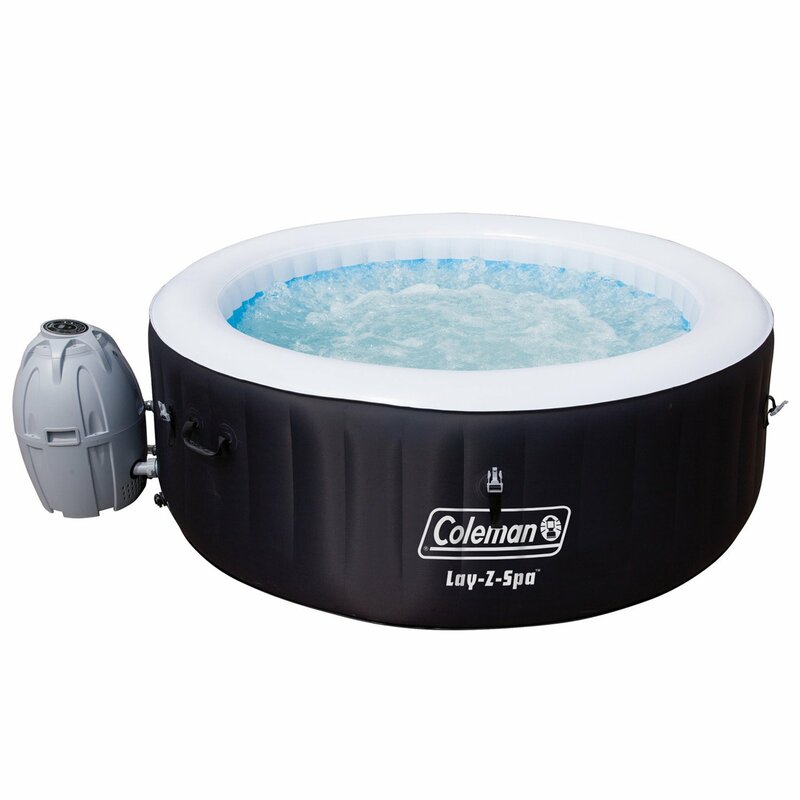 The Coleman Saluspa 4-Person Portable Inflatable Outdoor Spa Hot Tub also has an aluminum coating, which will ensure that your water will still be warm while it’s waiting for you to soak in. The good thing about using the Coleman Saluspa is that it has a rapid system for heating since people don’t like it when they are waiting. This means that you will surely get your hot water in no time. Another good thing about this is that you can change the setting for the massage to suit your needs. Intex 77-Inches PureSpa Portable Bubble Massage Spa Set will let you pamper yourself at the comfort of your backyard. The heated water will be surrounded by bubble jets which will soothe your body. It is also equipped with a control panel that can easily be used help activate the high powered jets for a massage that is refreshing. Intex has a built-in treatment system, which means that it will make the water gentle on the skin for a more relaxing experience. You can also adjust the temperature to fit the personal preference that you have. The Intex 77-Inches PureSpa Portable Bubble Massage Spa Set is consists of 2 filter cartridges that can be replaced easily for a more simple maintenance task. To ensure that heat loss is kept to a minimum, there is a lock and cover, which can also be for safety purposes. Now, if you want to transport it or just store it, you can easily do that using its carry bag. 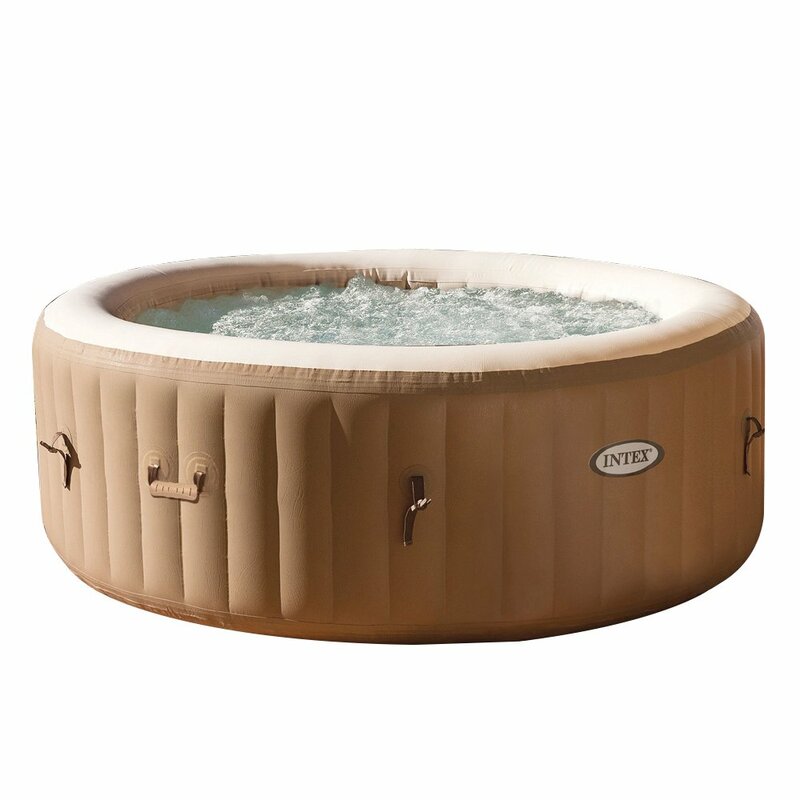 Another good thing about the Intex hot tub is that it can accommodate 4 people and has a 210 gallons water capacity. The temperature ranges from 68 yo 104 degrees Fahrenheit for a maximum relaxation. 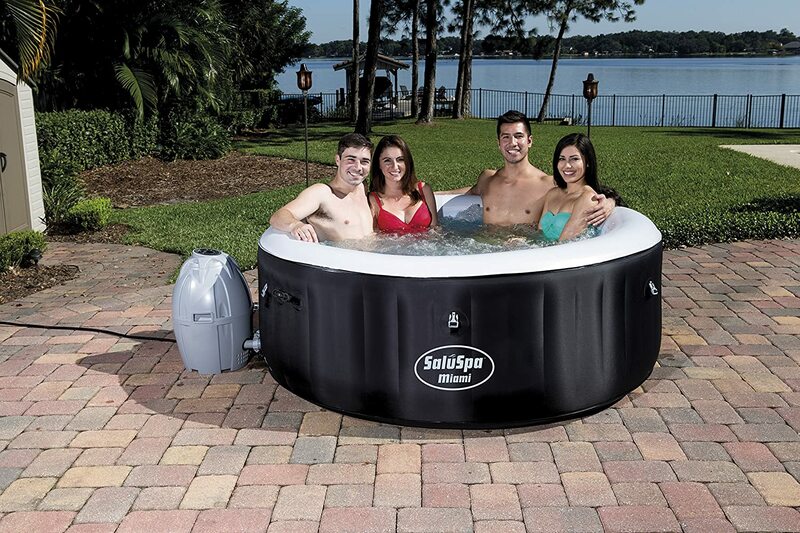 SaluSpa Miami AirJet Inflatable Hot Tub can easily be set up outdoors or indoors in just a matter of minutes. It can accommodate 4 adults comfortably, which means that you and your friends can experience an affordable and a soothing spa experience at your backyard. It has a Rapid Heating System, which means that your water can get heat up safely and quickly. It has a Digital Control Panel feature to help you control the temperature that you are comfortable in. You can also use the control panel to help activate the 120 bubble jets to provide you with the massage that you need. The SaluSpa Miami AirJet Inflatable Hot Tub is made out to TriTech material, to ensure its durability and stability. It is also puncture resistant, so you don’t have to worry about anything. All you have to do is to sit in the tub and let the bubbles massage your aches away after a long day at work. 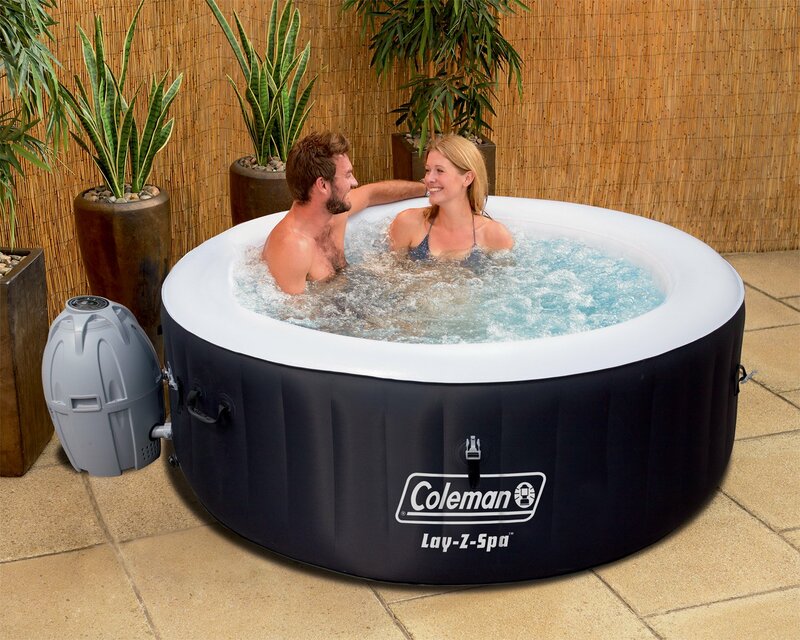 These are all the best hot tubs to choose from but of course, there will always be one winner in every review, and for this, the winner is Coleman Lay Z Spa Inflatable Hot Tub. The reason behind this is because it can accommodate 6 people and the walls will surely last for an extended period, for you and your family to be able to enjoy the hot tub longer. Start choosing the best hot tub for you so you can start experiencing the relaxation of having a hot tub in the comfort of your backyard.